pronounced burgundy color with sparsely distributed brown scales. The soft green bipinnate to bipinnate-pinnatifid blade is narrowly ovate with 8 to 12 pairs of pinnae. Sori and indu-sia are half-moon- to J-shaped. range and habitat: This species is from the ferny triumvirate of Japan, Korea, and China where it is a common woodlander. culture and comments: Far better known for its 'Pictum' showpieces, this species, with its subtle, soft patina of pastel greens and, on occasion rosy, foliar hues, wears quietly well in the garden community. 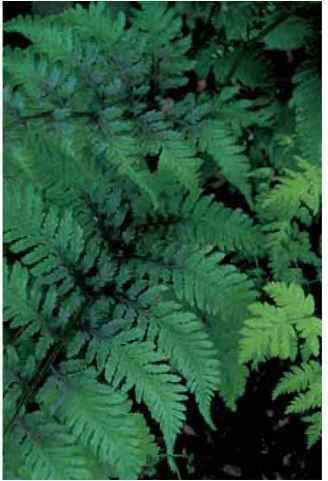 Easily cultivated, it is an attractive, albeit deciduous, addition to the low-maintenance section of the fern collection. Athyrium 'Branford Rambler' shares the coloration of the species but has long-creeping rhizomes and spreads gently through the soft compost of woodlands. 'Pictum' is the popular Japanese painted fern that has been, and occasionally still is, in the trade as A. goeringianum 'Pictum' and in even earlier times as A. iseanum 'Pictum'. Aside from maidenhairs, i do not think any other fern is better known or frequently planted as the token fern in otherwise fern-free gardens. The deciduous blades are silvery with an infusion of burgundy, offering foliar drama to the traditional greens of the fernery. It can be cultivated with confidence in all areas of North America from the warmth of San Diego, through the hot and humid interior sectors, to the cold fronts of Maine. 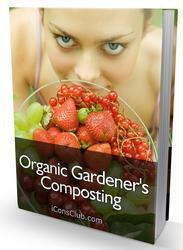 It settles in loose compost and light shade where it will provide fresh fronds throughout the summer. 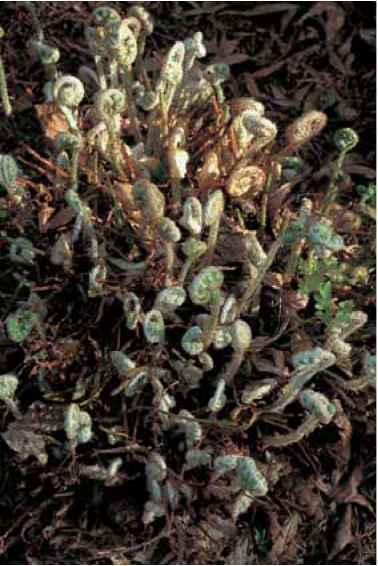 It was honored as the North American Perennial Plant Association's Plant of the Year for 2004, the first fern to be so recognized. As a side effect, however, a plethora of named selections swept through the marketplace competing for the gardener's attention (and dollar). Beyond the initial flush, however, many of these appear to be within a standard spectrum of shades and in time somewhat difficult to distinguish from one another. The soft flowers of Anemonella blend with the delicate colors of Athyrium niponicum 'Pictum'. Forking tips decorate Athyrium niponiaim 'Apple Court'. Athyrium niponicum 'Silver Falls' in the Guymon garden. The color is affected by both light and soil, becoming more intense in a site with consistent moisture and shade, tempered by bright indirect light. 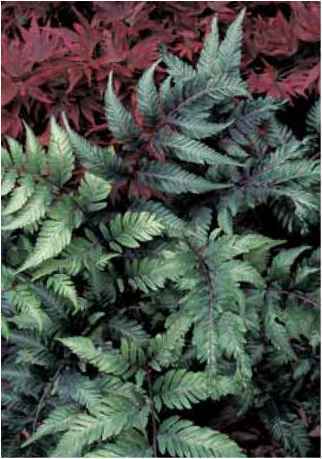 Sun will burn the foliage and heavy soils will produce poorly colored fronds (Archer 2005). 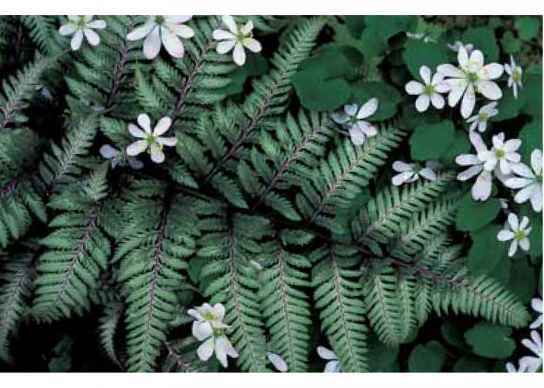 Selections of Athyrium niponicum include 'Apple Court',a truly different plant named by Roger Grounds and Diana Grenfell after their British nursery where it was discovered. The 2-ft. (60-cm) fronds are dressed in typical colors but are split at the pinnae and frond tips with varying degrees of cresting. 'Burgundy Lace' has an intense purplish center and new growth. 'Pewter Lace' has a metallic silvery light green sheen. 'Red Beauty' is brightly colored. 'Silver Falls' has more white than rose color. 'Ursula's Red' has a darker center. Several presumed hybrids of Athyrium niponicum 'Pictum' are known. Athyrium 'Ghost', discovered by Nancy Swell of Virginia, is a vertical display of steely gray (ghostly) swords to 3 ft. (90 cm) and a stunning addition among dark green foliage in shade. (Fronds tend to be brittle so choose a site with care.) 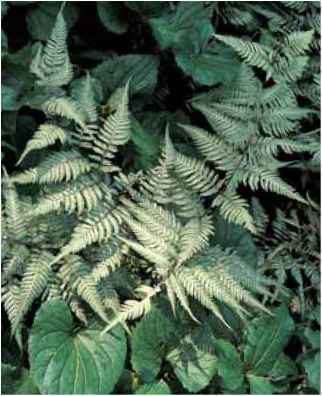 It is believed to be a hybrid between A. niponicum 'Pictum' and one of the lady ferns. I am hoping to coax a botanist into doing some genetic research on this hypothesis along with A. 'Branford Beauty', another possible cross between the painted and the lady, from the garden of Dr. Nick Nickou, in Branford, Connecticut. While not as tall, it too adds interesting variety to the painted collection. Propagation is easily achieved by division. Even when young, the rhizomes on the painted fern willingly branch, producing multiple growing tips. They can be left to naturalize freely or are easy to divide by cutting the leading edge and a connected piece of rhizome and roots and repotting. Likewise, growing from spores is joyously easy and brings forth quantities of juveniles offering the delight of watching the natural variations in height and coloration, including some reversions. Just please do not add yet another name unless your new plant discovery is 6 ft. (1.8 m) tall and evergreen!